Jeff (Victor) surprised me right before Christmas by asking me to marry him and I said YES. YES YES YES! Then there were all the happy tears and much hugging and celebrating. I’ve written this blog post with the whole story of the proposal for those of you (like me!) who want all the juicy details. We’re over the moon about the engagement and I have to say it feels fantastic to look ahead at our future together like a couple of love-struck kids. A second chance at love is a beautiful thing and our hearts are filled with gratitude and excitement. It was December 20 – just a random Tuesday in our everyday lives. I had two business meetings in the morning and Jeff was going to do some last minute Christmas shopping. I was in a great mood and eager to get the day started because this day was going to be our special Christmas celebration date. After my meeting, we were heading to The Hotel Phillips in downtown KC where we going to spend the night. We planned to have happy hour cocktails then head to a twilight matinee of the new Star Wars movie followed by dinner, drinks, and a show at our favorite jazz joint, The Green Lady. I could hardly wait! Jeff picked me up from my last meeting and we headed home to grab our things and go to Hotel Phillips. So there I am, standing in our bright, sun-shiny kitchen full of my summer plants and artwork made by our friends. I’m hurriedly opening mail and chatting non-stop about my meetings when Jeff looks at me intently and hands me a card. I’m thinking – oh how nice! – he got me a sweet Christmas card to celebrate our holiday date. I open the card and it’s Beautiful. Funny. Touching. Sweet. Perfect. 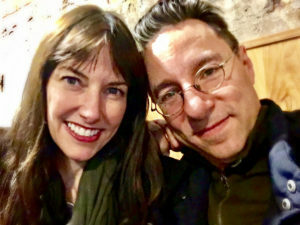 And it ends with the phrase, “I can think of no other way to spend the rest of my days than by your side.” I look up, understanding, and Jeff says, “Erin, will you marry me?” Just like that. All the tears started and I was grinning and crying and saying YES! I cried! He cried! We cried! It was awesome! We hugged and laughed for a little while until I realized he had handed me a box that I hadn’t even opened. (duh!) Inside the box was a treasured family ring that means a great deal to me and I love the symbolism of proposing with that ring. But that ring is a placeholder because we’re going to have my much-loved Grandma’s ring repaired and sized to fit me. My Grandma and Grandpa were happily married for over 60 years and I can’t think of a more steady representation of commitment than their marriage. My Mom wore this ring after my Grandma passed, my sister has cared for the ring since my Mom passed, and now it will be an honor to wear it until it’s time for me to pass it along to my niece and nephew. I’ll post pictures of my Grandma’s ring after it’s repaired and sized. 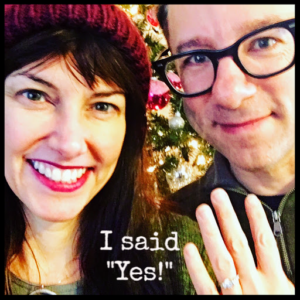 It was an incredible experience and the proposal in my beloved kitchen was perfect – very real, very us. We are clear-eyed dreamers, and we’re ready. We dried our eyes and hurried to the Hotel Philips to check in. The hotel was decorated so beautifully – everything was gold and shimmering. Perfect! 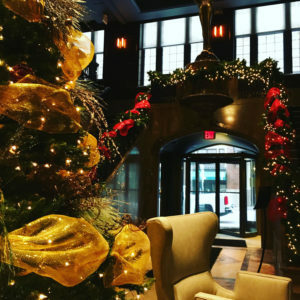 Historic Hotel Phillips Kansas City, shimmering and gorgeous, all dressed up for the holidays. We got to our room and chilled champagne, flowers, and my favorite cookies were waiting for me. Again, perfect! We toasted our engagement and headed out to the movie theater to see a twilight matinee. We saw a friend at the theater and we couldn’t help ourselves – he was the very first person we told. We then facetimed our families from the lobby theater to share the good news and the holiday celebrations began in earnest. Facetiming our families from the Alamo movie theater lobby. Casual dinner at BRGR with my fiance. 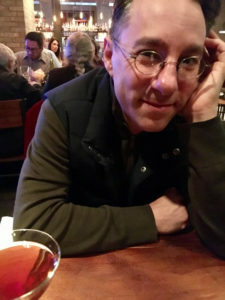 The whole night was perfect – the movie, dinner, cocktails at Tom’s Town and late night jazz at the Green Lady Lounge. The night couldn’t have been any more wonderful than when we walked back to the hotel in love with the night, our city, and each other. BUT WAIT. So that’s how the proposal went from MY perspective. Jeff had quite a different morning. To begin with, Jeff says he had been thinking about proposing for most of the year. He was thinking my birthday, and then he thought New Year’s Eve, then Christmas Day, then Christmas eve, and then he says he woke up Tuesday morning December 20 and thought: TODAY. After he dropped me at my first meeting, he called Hotel Phillips to see about having champagne and flowers delivered to the room. Strangely, no one answered the phone, even after several attempts. Panicking, he drove to the hotel in person to request the goodies in the room. The hotel staff was very enthusiastic, but they were unable to meet the request because they are under construction and had no kitchen! So Jeff jumped back in the car and went shopping for all the goodies, then took them back to the hotel so the staff could place them in the room before we arrived. He dashed back home to write out the card and get himself and the ring ready. 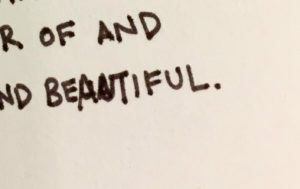 And then, when Jeff was writing out the card for me he made a mistake on the word, “beautiful”. AARGH! The first attempt was not beautiful enough, it seems. 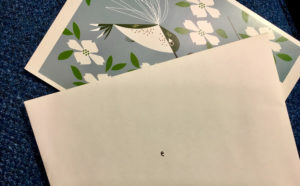 He said he couldn’t bear the thought of something sloppy on this most important card (note: Jeff’s tidy and tiny handwriting is the stuff of legends), so he got back in the car and drove to the art store to find another copy of the same card. Thankfully, they had one. He bought that and went back home to write out the card. By then it was time to pick me up. When I got in the car – I smelled those cookies, even though they weren’t in the car anymore (I tell you – I love those things!) I kept asking what smells like vanilla and sugar? He just played dumb, but I find this hilarious now. Remember how I said it’s hard to surprise me? Somehow, he got it all done and everything went just right. The great thing about getting engaged over the holidays is that everyone is in town and everyone is celebrating! The news of the proposal made our family gatherings more special and our friends have been wonderful. 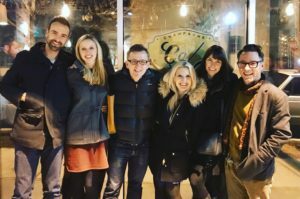 We’ve had several nights out to toast the engagement, including this special night celebrating with our friends and fellow musicians including Barclay Martin and his fiance Ali Ebright of Gimme Some Oven who got engaged the same week we did – so fun! Celebrating at CaVa with friends who got engaged the same week as we did. I’m thinking, writing, and talking about what this new commitment means and how at peace I feel about this decision. I have a daily meditation book that Jeff’s mom gave me and the word for the day on the day after the proposal was, “Engagement”. What are the odds?! 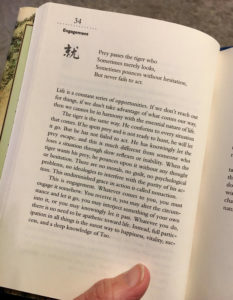 I love the last line of this entry, “…full participation in all things is the surest way to happiness…” Trusting your heart to someone fully – engaging 100% with no reservations – is a beautiful feeling. We don’t have any plans made yet – a ceremony in spring most likely. In any case, we’re savoring this time and these feelings right now. Thank you so much for coming along on this crazy ride with us. Our hearts are full of gratitude. It’s going to be a great year!